By August 22 plans were in place to seize Libyan oil fields and ports that were under the control of the oil installation guards led by Ibrahim Jadhran who is allied with Tripoli’s government of accord, working under the command of the presidential council’s national guard (LIFG). To prepare the way for the liberation of the oil crescent, Sheikh Saleh Alatyosh delivered a stern warning to the men serving under Jadhran. *I ask the people of my tribe to ensure that no one has a son in the oil installations guards…and advise them to return to the embrace of the tribe…We are with the national army under the leadership of the Khalifa Haftar, with Parliament headed by Saleh and the government emanating from it and we in Cyrenaica do not recognize the legitimacy of the presidential council. In 2013 Ibrahim Jadhran declared war on Tripoli’s GNC, announcing Cyrenica’s autonomy and return to the kingdom of Libya’s 1963 regional borders. With Sheikh Saleh Alatyosh’s announcement, not only were Jadhran’s political ambitions annihilated. The imperialist plot to partition Libya was crushed. 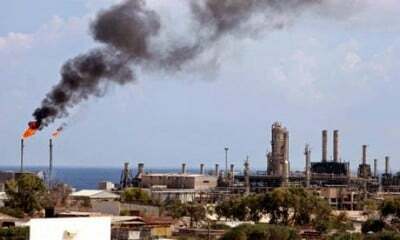 The Libyan National Army launched their strategic strike on the oil installations on Sunday. Aerial bombardments were immediately followed by ground assaults. Within hours the oil fields and ports were firmly under their control. In an appeal following the victory, Sheikh Saleh Alatyosh offered assurances to Jadhran that if he surrendered to the army he would be well treated. He urged employees of the oil installations to cooperate in a peaceful handover of the facilities to the armed forces in Ajdabiya. He cautioned them to refrain from further sedition and bloodshed and return to their homes. The victory was a humiliation for the UN-instated presidential council and the foreign nations backing the puppet regime. Fayez al-Sarraj was in the midst of a meeting in Italy when the news of the LNA victory reached him. Clearly shaken, he returned to Tripoli to assess the damage and save what he could of his reputation and that of the sham regime propped up by the United Nations and NATO. After months of the government of accord’s show battle in Sirte under the command of al Qaeda and LIFG forces, where hundreds of Misratan fighters lost their lives as Da’esh left the city in concerted waves seeking a new base, the Libyan National Army, impeded by international sanctions, proved itself to be the superior, most effective force in the country, capable of defeating terrorist armies, securing Libya’s resource wealth for the people, restoring the rule of law and protecting the civilian population. The power of the Tribes must also be considered. This victory was achieved through the Libyan National Army’s alliance with Tribal leaders. While the United Nations and foreign interlocutors continue to exclude the Tribes, this victory demonstrates that nothing of benefit to the people in Libya happens without their cooperation. However many meetings the United Nations may host in the name of national reconciliation, they have no power or authority. Their efforts, their declarations and political agreements are dismissed as irrelevant, illegitimate, unwarranted interference in Libya’s sovereign affairs – the most recent deprecation being the Supreme Council of Libyan Tribe’s response to the Tunis meeting held earlier this month. Authentic Libyan dialogues are the sole province of the Libyan people and the Tribes. Today the governments of France, Germany, Italy, Spain, United Kingdom and the US issued a joint statement condemning the Libyan army’s victory, demanding that the legitimate armed forces withdraw immediately, without preconditions. They falsely claim that the energy infrastructure is under threat and that only their client regime in Tripoli should have control over Libya’s rich reserves. In a statement issued last night, the General Command of the Libyan armed forces made it absolutely clear that oil production and export would continue under the control of the National Oil Corporation (NOC) and that their role would be limited to protecting the facilities from further attempts by terrorist militias to unlawfully profit from the sale of Libya’s resources. *“Zueitina, Ras Lanuf, Brega and Sidra are under the protection of the Libyan National Army whose responsibility it is to guard the people’s livelihood from tampering and corruption. While the army will continue to protect the installations and ports, the responsibility for all operations is in the hands of the National Oil Corporation given that this task falls under civilian jurisdiction. They assure the Libyan people that their actions were aimed at restoring the people’s control over their resources and destiny, to alleviate the suffering of the people and to enable them to fully benefit from wealth generated from their sovereign resources. The General Command urged the legitimate competent authorities to assume its responsibilities immediately, in accordance with the legislation in force. The imperialist nations will not relinquish their neocolonial ambitions without a fight. Indeed today, there are calls for urgent foreign military intervention to wrest control of the oil crescent from the legitimate armed forces, placing them back under al Qaeda-LIFG management. What has become clear from this weekend’s victory is that the neocolonial powers have fewer friends and far less power in Libya than they had previously thought, and what little influence they possess has been greatly diminished by this single act of defiance and assertion of sovereignty. That the Libyan Army’s liberation of the oil crescent took the NATO allies by surprise also reveals the inadequacy of the allegedly omnipotent foreign intelligence presence when confronted with superior strategists of a people that will never be subjugated. This victory is the beginning of a series of surprises for empire as phase by phase, plots against the Libyan people are exposed and defeated, foreign occupation forces and their minions vanquished. *“Translations of official statements are approximate. Please refer to the original through the link provided in the body of the text.